The POWER in HIS Name! Luann Prater, speaker for Proverbs 31 Ministries shared her heart with us on Saturday at the “She Speaks Conference”. I urge you to go to the site and purchase the CD of the session, “Preparing for the Battlefield Through Prayer”. I promise you will be blessed. But please allow me to share this…. I was already weepy-eyed from the session, but when I entered the prayer room, a feeling of utmost holiness came over me. I had the immediate urge to remove my sandals. I did so quickly and put them against the wall with my bag. Now, I didn’t check the feet of the other women in the room to see if they felt the same urgency, but I knew God had a message for me and I was on ground that had been prayed over and into with the mightiest of fervency. 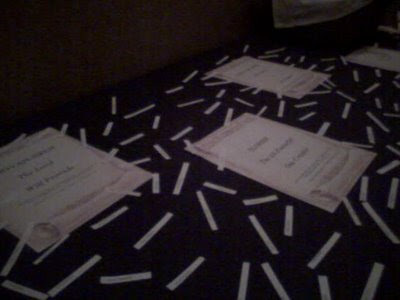 As Luann had said,the “Names of God” were on both tables, along with little slips of paper scattered randomly all around. 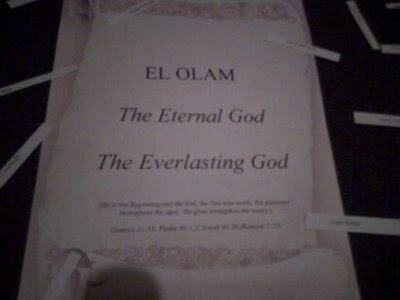 As I looked at the first Name of God, it was, El Olam, the Eternal God, the Everlasting God. 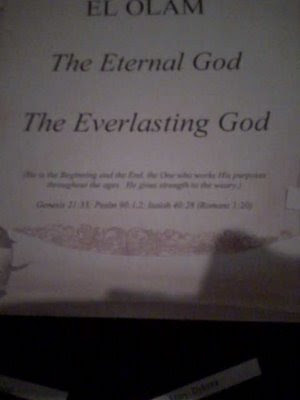 The next line said: “He is the beginning & the End, The One who works His purpose throughout the ages. He gives strength to the weary.” As I read that, I said to myself and to the Lord, “I am weary”. 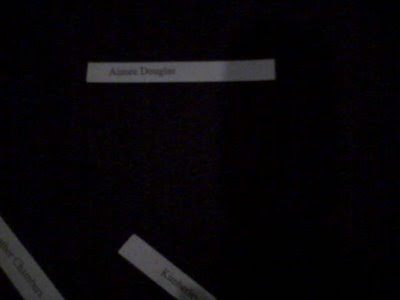 As I searched the table, peering at all the names, I realized my name was laying directly on that page. As tears began to fall down my face, I realized this was the Lord’s love note to me. I cannot express fully the impact of the feeling of that room. If you can imagine standing at the entrance of the cave where Jesus had just been resurrected …the feeling of expectancy, the urgent desire to “seek Him”. That is exactly what everyone began to do as they entered the room. There were benches for kneeling, chairs placed in circles for group praying, and there were pillows on the floor to fall on your face before the Almighty. There was music playing softly…and I think I could detect the swooshing of the wings of angels as the carried the prayers and praise up to the Father in Heaven. I knew that I needed to find Aimee as quickly as possible—to show her “her name”! As I began to make my way back to my shoes, I wondered, “how will I find her in this crowd of women”, for by now all the classes had dismissed and there were women everywhere! But when I opened the door, with her back to me stood Aimee, directly in front of me at one of the many book tables. I hurried over and told her “you have got to come find your name!” She looked at my face, tear streaked and puffy-eyed, and I am sure wondered what I had just seen. As we walked into the room, I slipped my shoes back off and she did likewise, we walked over to the first table, as she began to read, I told her to look for her name as she read the Names of God. I already knew where her name was, but didn’t tell her right away. When she found her name, after she read the page nearest her name, she too began to weep. 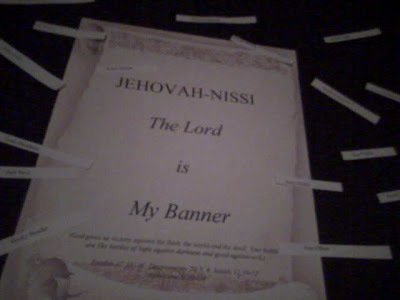 The Name of God was, “Jehovah-Nissi”—the Lord is my Banner! She explained that the Lord had given her that very scripture when her son had gone missing for a few days last year. As the family sought God, in His love and mercy, He whispered into her heart that He was her Banner! The scripture verses listed was the VERY VERSES that He had given her through those hard days of living. The name of each woman at the conference was on those tables. Laid out before the Lord, we are vessels for His use. As lives were changed this weekend, the Lord is preparing us to seek Him more, work in His fields, prepare His harvest, doing what He calls us to do, as we live our lives each day. In the world, but not of the world. Sitting in groups as we were, around the large tables, with the noise of chatter on everyside, I had to “scoot” my chair up close to those around me to hear what they were saying. Ladies, scoot your chair up close to the Father so that you can hear Him as He speaks to your hearts everyday. He does you know. He loves it when we share our hearts with Him. This entry was posted on Monday, June 23rd, 2008 at 9:11 pm	and posted in Missions. You can follow any responses to this entry through the RSS 2.0 feed. ahhh what a true tale. What a beautiful sharing! Doesn’t He love us so very much? Why do I doubt this?? ?How wonderful to read of your experiences. Tears are coming to my eyes. How wonderful to hear of His message to you and Aimee.Praise Him! My heart has been so touched by this precious post my dear friend. God is so beautiful. I love you. 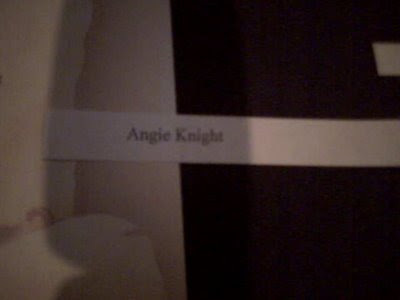 Oh sweet Angie! It was an amazing weekend and it was so precious to look into your eyes in person. It just amazes me how God can meet the needs of 560 women all in one place – so intimately and individually. The prayer room was an awesome place.What a mighty God we serve! Angels bow before Him, Heaven and earth adore Him, what a MIGHTY God we serve! This is a sweet post, thank you for sharing this story with us. Blessings. The pictures are so powerful sweetie. I am so sorry I missed the prayer room! What a wonderful experience. I think I ordered the cd though.What wondrous love! I wish I could have heard the Lawrence Welk…I love your photos! Great job, now I can visit YOU for a fix. Memories.Love ya! Oh Angie…I still have goosebumps from reading this post!!! What a blessing!!! Thanks!!! This is the love of our God. Personal and real. And powerful.I am full of gratitude after reading this…Praising HIM!